Throughout the World Cup, most American restaurant chains have thrown up a tweet with #IBelieve and called it a day. 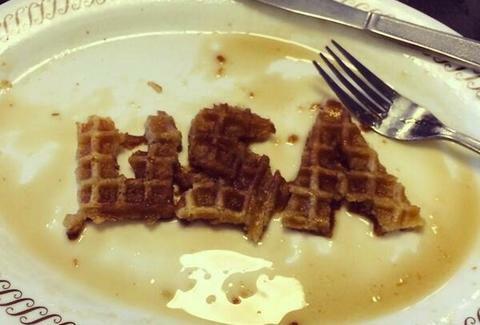 But one premier waffle destination is so Team USA, it's declared an all-out social media war on Belgium. Ahead of today's US vs. Belgium match (4pm EST), Waffle House has mounted an attack on the thing Belgians hold most dear (after chocolate and those peeing statues): their waffles. Even with the slight typo, this first shot quickly gathered support among Waffle House's most patriotic fans. Several hours later, WaHo isn't showing any signs of backing down. In fact, the chain offered this syrupy show of nationalism earlier today. We can only hope Team USA ate something identical this morning in Brazil, because it's clearly the breakfast of champions. Kristin Hunt is a food/drink staff writer for Thrillist. She loves Belgian waffles, but she also loves America, so she'll join the boycott for today. Follow her at @kristin_hunt.